We recently celebrated the topping out of the Southern Area Aquatics and Recreation Center project. Together with our Design-Build partner, Hughes Group Architects, we are working vigorously to deliver this 2-story, 76,295 sf cutting-edge facility for the Maryland-National Capital Park and Planning Commission (M-NCPPC). The residents of Brandywine and Prince George's County will soon be able to enjoy the first multi-generational community center in the county and we are delighted to deliver a facility that will appeal to the county's diverse demographics. The long-awaited recreation center includes a gymnasium, natatorium, multi-use and programmed spaces, event space, fitness areas with locker rooms, and an elevated three lane running track. Our project team is determined to ensure that this facility is the centerpiece of the community for decades to come. This project could not take shape without the determination from our dedicated subcontractors. 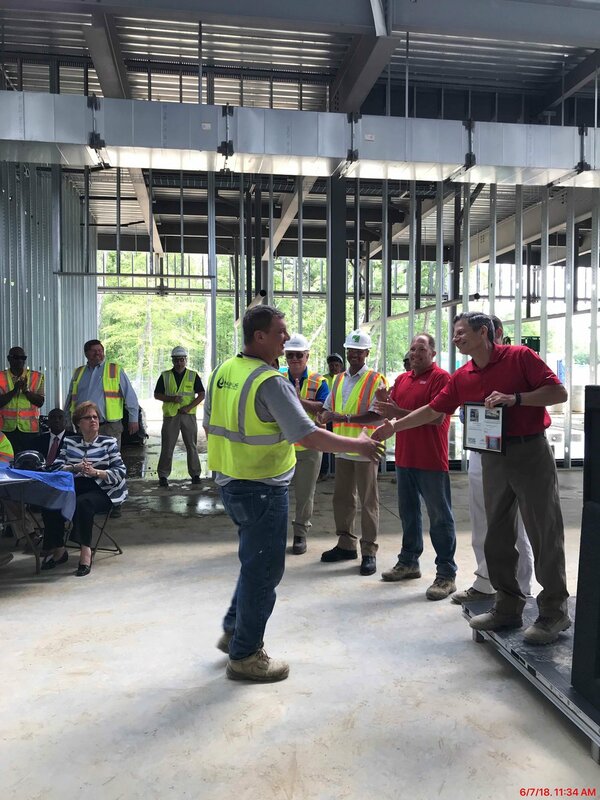 At the Topping Out celebration, we recognized several of our subs for their individual efforts on safety and overall project excellence. We are proud to see the hard work from everyone involved in this project come to fruition and look forward to delivering a superior project to the community later this year.